Anyway, I came upon this pretty sight. And no, it’s not another sunrise. Now, I have no clue what this cactus flower is called. I’m just not into stuff like that. But what I AM into, is the idea of stopping and taking a second to enjoy the things around you. Ever since my MIL fell ill with cancer and is now approaching the final days of her life, it’s really made me re-think things. One of which is how fast-paced I live life. So, I stopped and enjoyed this nice little sight. 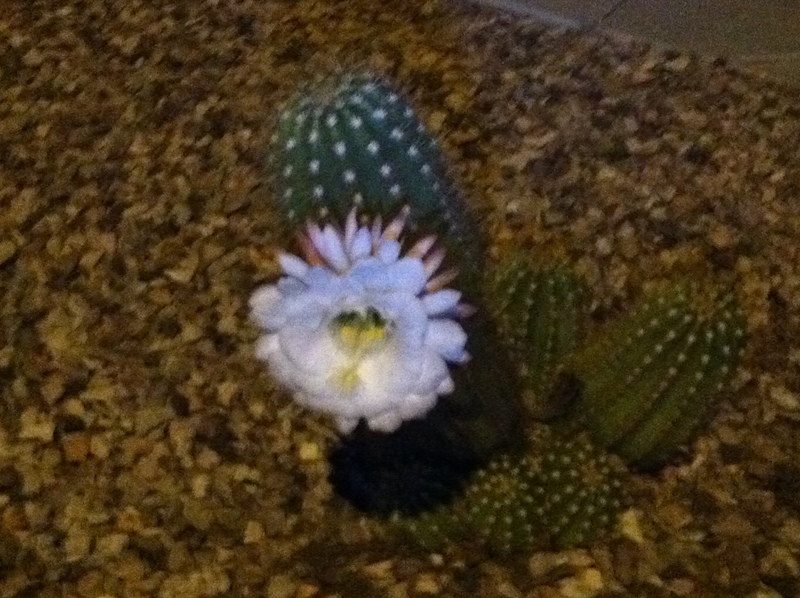 It’s amazing how a beautiful, delicate flower can emerge from a thorny, prickly desert cactus. This entry was posted in Life and Whatnot and tagged Cactus, Catch the Rush, Desert Living, Lynn Rush, Paranormal Romance, Stopping to Smell the Roses, Urban Fantasy by Lynn Rush. Bookmark the permalink. I don’t know my cacti, living in the tundra as I do, but I totally hear the ‘stop to enjoy’ thing. Cancer is sort of a strange gift that way–it is slow enough that we have time to learn some important lessons. I’m sorry your mother in law is ill, as it is a horrible thing for all involved, but cherish the lessons. “Cancer is sort of a strange gift that way–” You nailed it. And Lynn has used her illness to reach out to many people. She’s a trooper. That’s a gorgeous flower! No idea what it is, but yeah, the contrast between the beautiful petals and the prickly spines is beautiful. I stopped to smell the roses in a very unlikely place on Saturday – the mall. There’s a pretty, bricked area in front, and all three of my kids just started playing tag there at dusk. Not sure what struck me about it, but I think it was the fact that I don’t see them running around outside and having spontaneous fun like that often. To me, that’s beautiful. Yeah. I’m so not into naming flowers. Clueless, actually. But it just caught my eye that morning for some reason. 🙂 I love your example, Kendall. I think it would be awesome to just sit and watch your kids like that. Awesome! I think Lindsay said it best. My prayers will also continue for you and all your family. It’s very simple Lynn. That cactus flower is called beautiful. Just like your MIL is, beautiful. And as your husband sees you and everything around you both. My prayers are with you and your family and extended family during this time.